Poland have sacked coach Waldemar Fornalik after their failure to qualify for next year’s World Cup finals in Brazil, the Polish FA said. 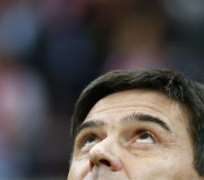 Poland have sacked coach Waldemar Fornalik after their failure to qualify for next year’s World Cup finals in Brazil, the Polish FA said on Wednesday, Reuters has reported. Poland’s 1-0 defeat in Ukraine last week meant they could not reach the 2014 tournament and they ended the campaign with a 2-0 defeat by Group H winners England at Wembley on Tuesday. Poland finished fourth with 13 points from 10 games. Fornalik, former coach of Polish club Ruch Chorzow, was appointed national team coach in July last year after Franciszek Smuda was sacked following his side’s a dismal performance at the Euro 2012 tournament, which Poland co-hosted with Ukraine. Polish FA chief Zbigniew Boniek, the former Poland international who also played for Juventus and AS Roma, will hold a news conference at 1300 GMT on Wednesday (today).